Kinzua Bridge is one of the most stunning things to see within the state. The Kinzua Bridge/Kinzua Viaduct, was the tallest railroad bridge in the world when it was built. Before its partial destruction, it was the fourth tallest railroad bridge in the country. It was a part of the New York, Lake Erie, and Western Railroad, on a spur line that lead towards the then important coal fields in Elk County. It was billed as the "Eighth Wonder of the World" upon construction. The first bridge on this site was short lived, lasting from 1882 to 1900. The bridge was a giant wrought iron trestle that could not handle the much heavier trains that came about at the start of the 20th century. The current bridge was built by the relatively local Elmira Bridge company out of New York. At its tallest point it was 301 feet tall. Now the tallest point is just over 200 feet off of the ground. They added a glass walk at the end of the bridge, if you are brave and want to take a look down to the valley floor. It is really quite a spectacle! The visit was brief. The bad weather that spared us in the PA Grand Canyon, and Potter County, caught up with us at Kinzua. It was pretty awesome though! The gusts were in excess of 40 miles per hour, and the weather could not decide if it wanted to rain or snow, so there was a mix of both. The wind was intense! I seldom feel fear at heights, but this was definitely one of those moments, considering the weather history in this deep valley that we will learn about shortly. Upon entrance to the park you can see the way the trains were were rerouted, avoiding the previously necessary trip over Kinzua Bridge. This train was a part of the Buffalo and Pittsburgh Railroad, an important regional railroad. The new visitors center is coming along great. This should really be a great attraction once it is completed. In the middle of a historically giant storm, an F1 Tornado with wind speeds of close to 100 MPH lifted a portion of the bridge and sent it crashing down into the valley. In neighboring Potter County, an F3 Tornado was started by this same storm. It is a wonder that this much of the bridge was able to withstand the storm. The bridge appears almost endless out into the horizon. The skywalk here is pretty awesome. The other time we visited here, the weather was calm. Having some pretty intense weather certainly made this quite an experience. The gusts were up to 40 MPH in the area of the bridge. There is a glass skywalk at the end of the bridge, so you can clearly look down over 200 feet into the valley. Here is the view off of the end of the bridge. The wreckage ruins are strewn across the giant valley. At this point the gusts were picking up to roughly forty miles per hour. And the rains were picking up, as seen on the lens. The view back towards the other end of the bridge. 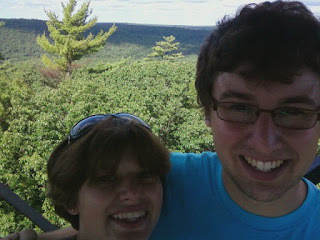 The view off of the side of the highest point. Simply spectacular. I was certainly unsure of my ability to hold onto the camera at this point. These winds were serious, and knowing about the history here, it was quite a thrill. This bridge was clearly shored up well. I was expecting for there to be even just a little bit of flexing. The bridge was nice and rigid, though I felt like I was going to fly away like a kite! It is amazing how on a calm weather day, that this place is so tranquil, but on a strong weather day this place is wild. If you are in the area, be sure to check out the nearby Elk country, Cook Forest State Park, Allegheny National Forest, Allegheny Reservoir National Recreation Area, and the rest that this amazing area has to offer. Each of these individual things could easily cover a single weekend trip, so I highly recommend spending some time in this awesome area. The Route 6 corridor across the whole state is awesome and you need to check it all out! Us climbing the Fire Tower at Cook Forest State Park. There was no time for us to visit this time, but if you are in the area, you certainly want to spend some time at Cook Forest, checking out the most intact first growth forest on the entire East Coast. Cook Forest Pennsylvania's equivalent to Redwood National Forest and Yosemite National Park's giant redwoods, with giant hemlocks, cherry trees, oaks, and more. Truly a stunning place! This awesome area is also home to the largest elk herd east of the Rockies. The scenes of these magnificent animals are reminiscent of these majestic animals in the Rockies, of the buffalo in Yellowstone, and of the moose that wander freely in Alaska's Denali. Pennsylvania's natural wonders are all beautiful, though the natural wonders of this area are reminiscent of some of the world's most famous places. This is truly unspoiled land that is always a joy to check out.